It’s about time you faced it: Chocolates and roses are a cliché. But there’s a better way to celebrate Valentine’s Day—and while it does require a trip, it’s not to the jewellery store (although that’s never a bad idea…). 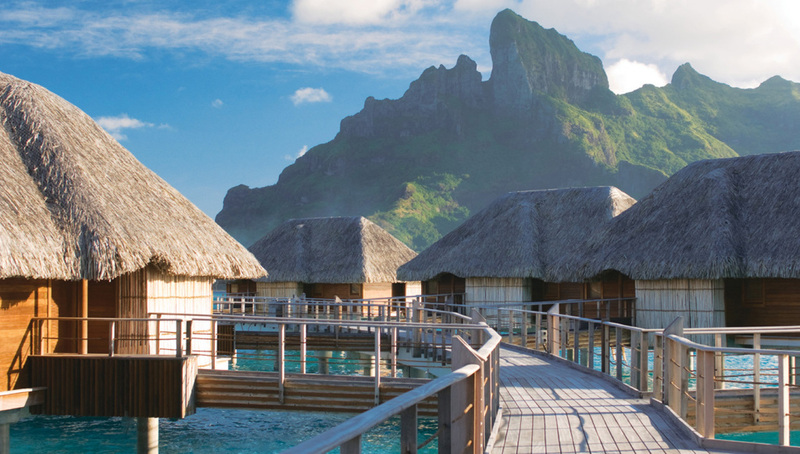 This February, the new de facto gift for romance will be travel, and we’ve got you covered with a list of the 10 best experiences that say “I love you,” from a stunning suite in the Seychelles to an overwater bungalow in Bora Bora. One thing’s for sure: These romantic resorts around the world will put that heart-shaped box of truffles you bought last year to shame. Prince William and Kate Middleton spent their honeymoon at North Island in the Seychelles, as did George and Amal Clooney, so it probably isn’t too shabby a choice for the Valentine’s Day set. Actually, our editors count the resort—a secluded private island smack in the middle of the Indian Ocean—as one of their favourite properties in the world. Making it most appropriate for romance are the 11 villas—and most notably the palatial Villa North—all of which spill out onto a perfect (and empty) private beach. Of course, there’s stuff to do, too: scuba diving, snorkelling, and sea kayaking included. But as mundane as it sounds, the most thrilling experience to be had on North Island is an evening cocktail at the very appropriately named Sunset Bar. Staying in an overwater bungalow is a bucket list experience that is best enjoyed as a couple, and there is no better place to do it than at the Four Seasons Resort Bora Bora. Set on a turquoise lagoon in the shadow of Mount Otemanu, the resort is one of the most magical destinations in the South Pacific. Guests can wake up and jump straight into the water for a refreshing start to the day, followed by breakfast delivered by canoe. There are a multitude of activities on offer (catamarans, volleyball, tennis courts, paddleboards), and unlike many resorts, there is no race to secure a sun lounger in the morning: The best spot to park for the day is on your own private terrace anyway. In an archipelago where every resort is a private island, the Maldives is a solid option for couples. It has all of the hallmarks of paradise: pristine white sand, shimmering turquoise waters, luxurious resorts, and a warm climate year-round (especially in February, which is smack in the middle of the dry season). The best place to stay and play castaway with your loved one is Amilla Fushi, located in the UNESCO-protected Biosphere Reserve of Baa Atoll. 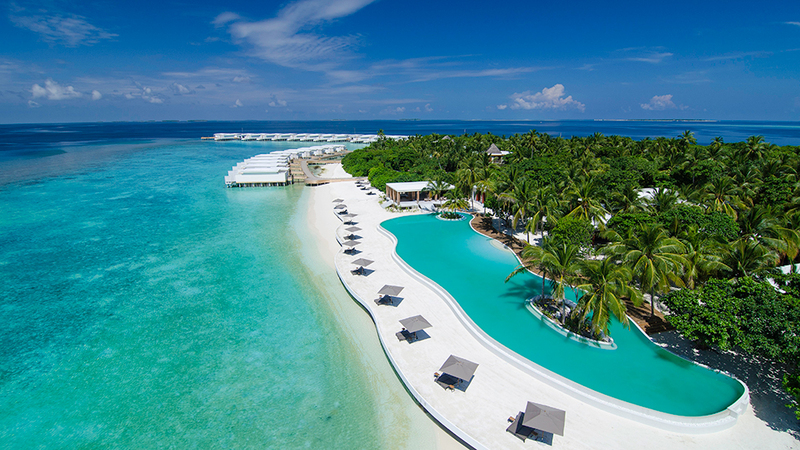 Since opening in 2015, the elegant resort has elevated the already-sky-high standards of Maldivian hospitality with incredible dining options (including an outpost of New York’s 1 Oak Lounge), a fabulous spa and wellness centre, and spacious overwater villas that provide the perfect escape for couples seeking complete serenity. There are no tropical clichés here: The decor is modern and whitewashed, giving off a Mykonos vibe. For Valentine’s Day this year, couples can book a sunken table in the Indian Ocean for a private dinner with Champagne and live music—the best setting for experiencing a vivid Maldivian sunset. 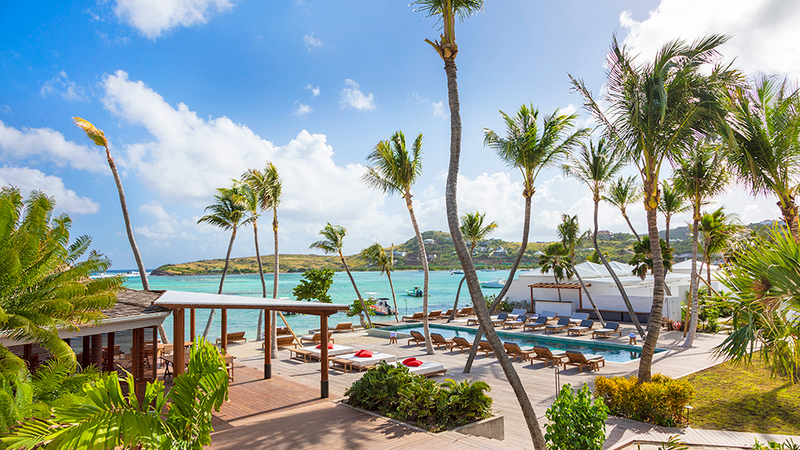 Regarded as one of the chicest destinations in the Caribbean, Cheval Blanc’s Isle de France is the perfect island holiday for couples that appreciate the finer things in life. The LVMH-owned resort is the first property outside of France to receive the coveted palace designation, and it certainly lives up to the distinction, surpassing the standard five-star benchmark and providing magical experiences for its guests. Last year the resort underwent a complete refresh with new interiors helmed by Jacques Grange, sculptures by renowned artist Jean-Michel Othoniel, and a new landscape design by Madison Cox, featuring verdant fruit trees, bougainvillea, and lush, tropical palm trees. It also unveiled new dining concepts, including La Case de L’Isle, which is hosting a special tasting menu for Valentine’s Day, along with acoustic live music and a Ruinart Champagne pairing. Between hours spent lounging on the private beach, couples can venture to the spa, where Guerlain Beauty experts will be offering special duo massages from February 14 through to 17. Dancing under the stars after cocktails at Basil’s Bar is the perfect way to spend an evening in Mustique. It’s one of the many romantic scenes that has lured celebrity couples and British aristocracy to the Cotton House over the years. There’s also the sprawling tropical gardens, dreamy sailing excursions, and pristine beaches that add to its charm. The resort is exclusive and full of character, with only 17 sea-view villas, suites, and cottages featuring private plunge pools and verandas, perfectly designed for in-room couples’ massages. LVMH’s recent acquisition of Belmond is testament to the standard of its properties, which are located in spectacular destinations across five continents. 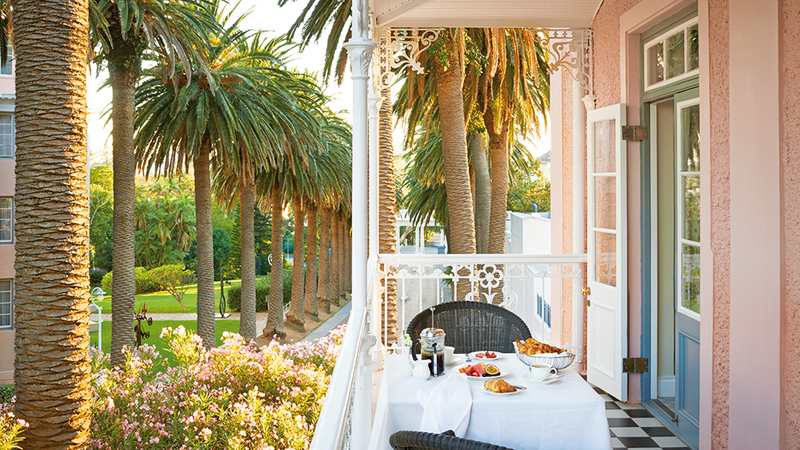 One of them is the iconic Mount Nelson Hotel in Cape Town, a rose-hued oasis at the base of Table Mountain. Although the property is surrounded by 3.6 hectares of lush gardens and stunning natural scenery, it is located right in the heart of the historic city centre, making it an appealing destination for first-timers to the South Africa’s most vibrant metropolis. It’s also an appealing destination for couples and honeymooners, who often opt to stay in the quaint Garden Cottage Suites, each enclosed with a private picket fence and fragrant roses. This year, the grande dame hotel is revving up the romance to celebrate Valentine’s Day, offering private picnics with Veuve Clicquot Champagne, a themed high tea and dinner, and special couples’ treatments at the spa. Those who want to go all out can commission portraits by artist-in-residence, Cyril Coetzee (Nelson Mandela’s portraitist), and to really make an occasion of it, couples eager to explore can embark on a week-long adventure, beginning with three nights at Belmond Mount Nelson, followed by four nights at Belmond’s safari lodges located in Botswana. 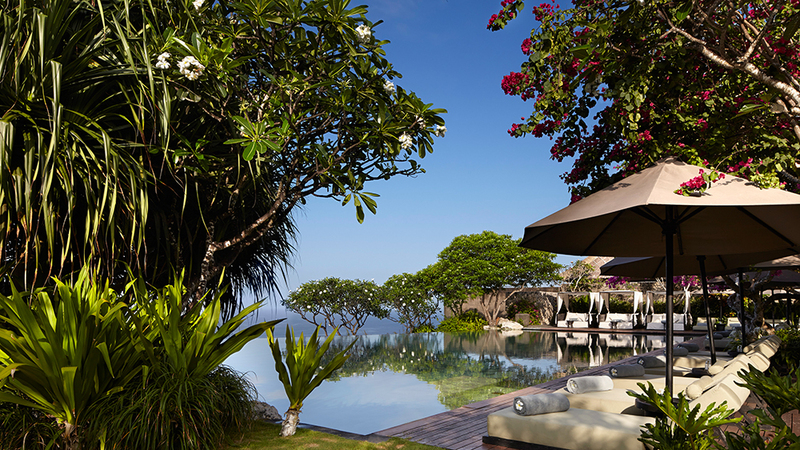 Bulgari Bali is one of Indonesia’s most beautiful resorts, located on a secluded clifftop in Uluwatu, well removed from the hustle of Seminyak. It opened in 2006, and over a decade on, it’s still trending, often being featured on wanderlust-inducing Instagram accounts. Like all of Bulgari’s hospitality projects, the design was helmed by Antonio Citterio Patricia Veil, the masters of fusing authentic local aesthetics with Italian elegance. Everything from the restaurant to the spa to the villas is polished, luxurious, and ideal for couples. The real showstopper, though, is the resort’s infinity pool, which overlooks the shimmering Indian Ocean and is framed with fresh white cabanas and vibrant bougainvillea. “It is important that each trip is unique, memorable and enhanced at every visit,” says Vladislav Doronin, chairman and CEO of Aman. 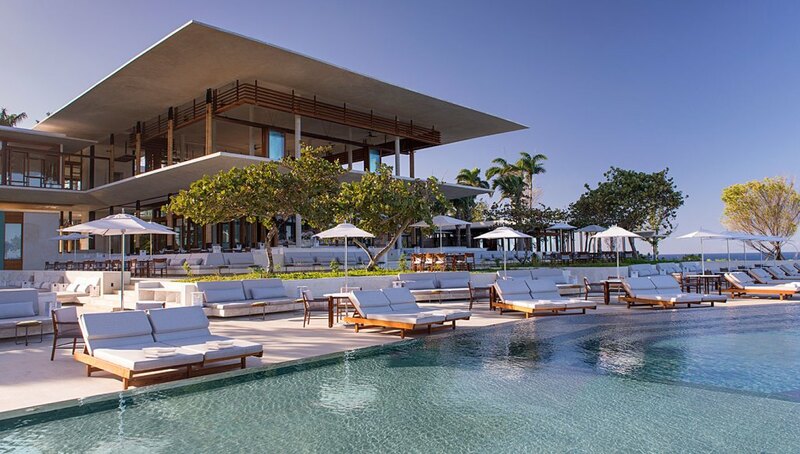 “All of the little touches, accompanied with our unrivalled service and outstanding destinations make an Aman experience unlike any other.” That could not ring truer for Amanera, which has elevated the standard of luxury in the Dominican Republic since it opened in 2015, fusing Aman’s formula for exceptional design, cuisine, and service with an idyllic beachfront location backed by lush rainforest. Everything is polished and perfectly appointed for couples seeking a relaxing, luxurious escape, where sitting back and savoring the serenity is all you need to do. New Zealand is home to some of the world’s most stunning luxury lodges that take privacy to the next level with completely unique locations. One of the most magnificent lodges in the North Island is Eagles Nest, set atop a private peninsula overlooking the glittering Bay of Islands. There are only five contemporary villas set within the 30-hectare estate, each affording 320-degree views across the bay. Four of the five villas offer horizon-edged lap pools, and each has a hot tub, indoor and outdoor fireplace, underfloor heating, state-of-the-art entertainment systems, and kitchens stocked with local artisan delicacies and wines. If you want to go off the map and experience somewhere memorable for a special occasion, Eagle’s Nest is an excellent option. 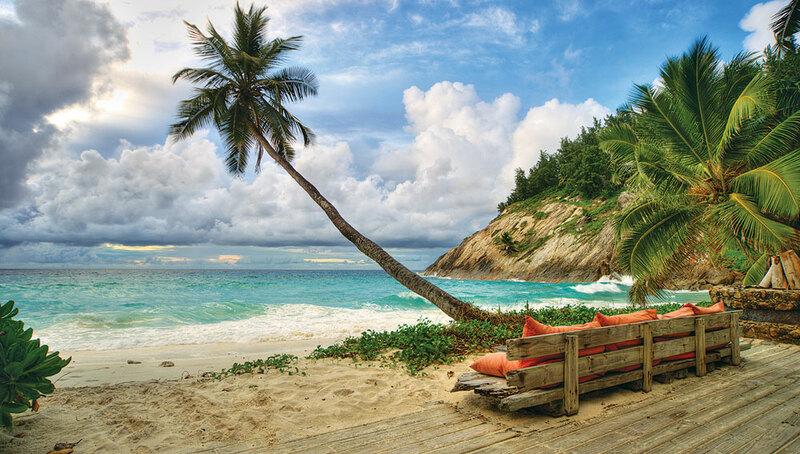 St. Barts is one of the most magical destinations in the Caribbean—so it’s no wonder there are two resorts from this island gem on our most-romantic list. With a slew of new and renovated hotels opening after the damage left by 2017’s Hurricane Irma, couples are spoiled for choice when it comes to Valentine’s Day accommodations. Chief among the best spots is Le Sereno, a longtime favorite for well-heeled travelers and celebrities that has reopened just in time for Valentine’s Day. 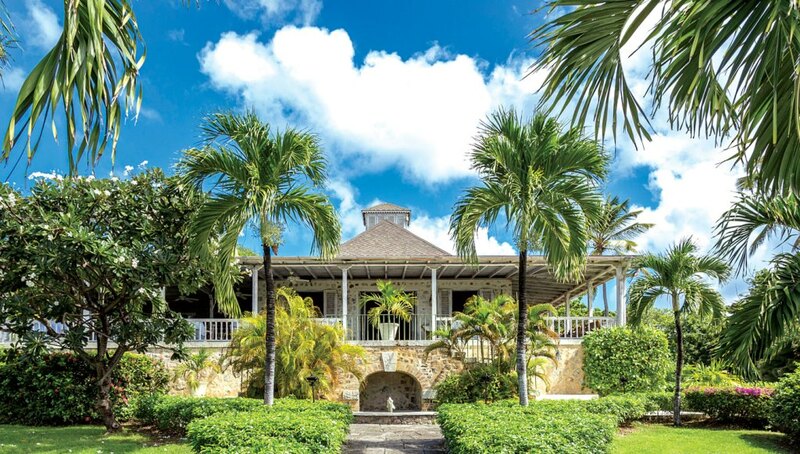 The new resort recently unveiled a fresh new design and state-of-the-art technology while still retaining the charm that has earned it a loyal clientele over the years. 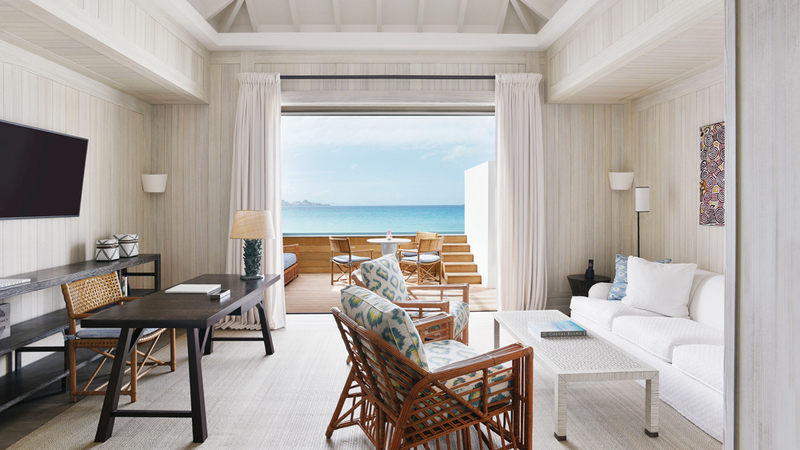 The resort now features a new beach restaurant, an extended spa and wellness centre, and fresh collection of suites and villas, ushering in a new era of beachfront glamour. Daydream Island really lives up to its name.